Nine stars, showbiz & sporting personalities are gearing up for the annual Footy Show: My Room Telethon tomorrow night. The event to raise funds for children’s cancer charity My Room will begin with a special episode of Hot Seat as family, friends and staff of Monash Children’s Hospital compete, with Nine matching winnings dollar-for-dollar, donated to the cause. The Footy Show will screen live from 7:30pm in Melbourne, with other cities at their usual times. AFL stars will be taking donations for this very special cause in the Telstra Celebrity Phone Room, including Max Gawn, Jack Gunston, Mitch Duncan, Charlie Curnow, Brendon Goddard, Jack Ziebell, Jarryd Roughead, Majak Daw, Jordan Lewis, Marcus Bontempelli, Christian Petracca, Robbie Tarrant, Tom McDonald, Marc Murphy, Scott Selwood, Harry Taylor, Lynden Dunn – and the list goes on. High-profile celebrities will feature on a rotating panel and join in the epic stunts, including Shane Warne, UFC legend Georges St-Pierre, funnyman Andy Lee, Richmond coach Damien Hardwick and My Room ambassador Luke Hodge. AFLW champions including Brooke Lochland, Chloe Molloy, Bonnie Toogood, Holly Whitford, Sarah Dargan, Sarah Hosking, Jess Hosking and Steph Chiocci will be joining the boys in the phone room as well as snowboarding Olympian Scotty James. Huge names from the entertainment industry will be lending a hand, including Rodger Corser, Natalie Bassingthwaighte, Rebecca Judd, Gyton Grantley, Kate Jenkinson, Gary Sweet and Damian Walshe-Howling. Fan favourites from The Block, Nine News, The Voice, Married at First Sight, Love Island, Postcards, Kids’ WB, Getaway and many more Nine programs will also be fronting up to answer calls in the phone bank. 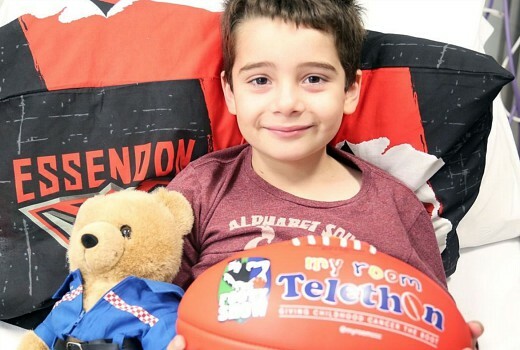 Last year the My Room Telethon raised an incredible $1.083 million, which went towards new projects at Monash Children’s Hospital, such as the My Room Clinical Research Fellowship Program, family support and vital equipment. An exciting addition to this year’s Telethon is the sale of a beautiful four-bedroom, two-storey Metricon home to be built in Satterley’s Botanical community in Mickleham, with the result of the successful auction announced live on the show. Tune in for a show that can’t be missed as the AFL, sports and entertainment worlds band together to help kids who need it most. You can donate by heading to www.myroom.com.au or calling the donation line during the Telethon – and together we can all give childhood cancer the boot.